Juncker started his five-year mandate on 1 November 2014 after winning a vote of approval from the European Parliament on 22 October. The first 100 days of the Juncker Commission were seen as crucial in showing citizens and national politicians that the former Prime Minister of Luxembourg is ready to deliver on his promise: a new start for Europe. As the first 100 days are now over, EURACTIV has asked European poilcymakers to evaluate the first months of #TeamJuncker’s work. The new European Commission led by Jean-Claude Juncker started its mandate on 1 November. The 28-strong team of EU Commissioners secured confirmation from the European Parliament on 22 October, winning over a grand coalition of Socialists and centre-right MEPs. Speaking to MEPs ahead of the vote, Juncker warned that his Commission represented the "last chance" to win back citizens’ trust. 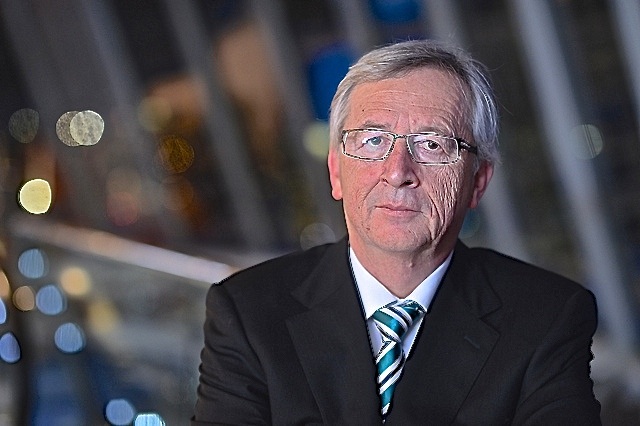 Pledging to break with the past, Juncker promised his team will be "very political". "Either we succeed in bringing European citizens closer to Europe, or we fail," he told MEPs. "Either we manage [...] to dramatically reduce unemployment, or we fail. Either we give a perspective to young Europeans, or we fail," Juncker said in a debate that saw him deploy humour to placate both the right and left. Junker may have the priviledge of overseeing the collapse of the Euro and the falling apart of the EU bureaucratic monster . Oh you know David …Some prophet long ago before you predicted the collapse of the d$llar , the €uro , the Pound , the rouble and so on ! Watch Youtube ? It’s full of all these conspiracies ! The European Union isn’t a bureaucratic Monster unlike the communistic fully centralized Westminster gigantic ! The E.U. institution doesn’t even federalize but it possibly could do it one day ! Give a try and look how it works ! E.U. ??? Not true !! Oh man you naively scapegoated the E.U. ! Officegate (2001). Henry McLeish, Labour First Minister of Scotland, failed to refund the House of Commons for income he had received from the sub-let of his constituency office in Glenrothes while still a Westminster MP. Jo Moore, within an hour of the September 11 attacks, Moore sent an email to the press office of her department suggesting: It’s now a very good day to get out anything we want to bury. Councillors’ expenses? Although prior to the catastrophic collapse of the towers, the phrase “a good day to bury bad news” (not actually used by Moore) has since been used to refer to other instances of attempting to hide one item of news behind a more publicised issue. In 2002, Edwina Currie revealed that she had had an affair, beginning in 1984, with John Major before he became Prime Minister of the United Kingdom. This was criticised more harshly than may otherwise have been the case as Major had frequently pushed his Back To Basics agenda (see above), which was taken by the media as a form of moral absolutism. The apparent suicide of Dr. David Kelly and the Hutton Inquiry. On 17 July 2003, Kelly, an employee of the Ministry of Defence, apparently committed suicide after being misquoted by BBC journalist Andrew Gilligan as saying that Tony Blair’s Labour government had knowingly “sexed up” the “September Dossier”, a report into Iraq and weapons of mass destruction. The government was cleared of wrongdoing, while the BBC was strongly criticised by the subsequent inquiry, leading to the resignation of the BBC’s chairman and director-general. In April 2004, Beverly Hughes was forced to resign as minister for Immigration, Citizenship and Counter Terrorism when it was shown that she had been informed of procedural improprieties concerning the granting of visas to certain categories of workers from Eastern Europe. She had earlier told the House of Commons that if she had been aware of such facts she would have done something about it. In 2005, David McLetchie, leader of the Scottish Conservative and Unionist Party is forced to resign after claiming the highest taxi expenses of any MSP. These included personal journeys, journeys related solely with his second job as a solicitor, and Conservative Party business, for example travel to Conservative conferences. Conservative backbench MSP Brian Monteith has the whip withdrawn for briefing against his leader to the Scotland on Sunday newspaper. Liberal Democrats Home Affairs spokesman Mark Oaten resigns after it is revealed by the News of the World that he paid rentboys to perform sexual activities on him. Tessa Jowell financial allegations (2006). Tessa Jowell, Labour cabinet minister, embroiled in a scandal about a property remortgage allegedly arranged to enable her husband to realise £350,000 from an off-shore hedge fund, money he allegedly received as a gift following testimony he had provided for Silvio Berlusconi in the 1990s. Popularised by the press as “Jowellgate”. In March 2006 it emerged that the Labour party had borrowed millions of pounds in 2005 to help fund their general election campaign. While not illegal, on 15 March the Treasurer of the party, Jack Dromey stated publicly that he had neither knowledge of or involvement in these loans and had only become aware when he read about it in the newspapers. A story was running at the time that Dr Chai Patel and others had been recommended for Life peerages after lending the Labour party money. He called on the Electoral Commission to investigate the issue of political parties taking out loans from non-commercial sources. See Cash for Peerages. Cash for Honours (2006). Following revelations about Dr Chai Patel and others who were recommended for peerages after lending the Labour party money, the Treasurer of the party, Jack Dromey said he had not been involved and did not know the party had secretly borrowed millions of pounds in 2005. He called on the Electoral Commission to investigate the issue of political parties taking out loans from non-commercial sources.In November 2007, it emerged that more than £400,000 had been accepted by the Labour Party from one person through a series of third parties, causing the Electoral Commission to seek an explanation. Peter Watt resigned as the General Secretary of the party the day after the story broke and was quoted as saying that he knew about the arrangement but had not appreciated that he had failed to comply with the reporting requirements. On 24 January 2008, Peter Hain resigned his two cabinet posts (Secretary of State for Work and Pensions and Secretary of State for Wales) after the Electoral Commission referred donations to his Deputy Leadership campaign to the police. Derek Conway (2008). Conservative Party MP found to have reclaimed salaries he had paid to his two sons who had in fact not carried out the work to the extent claimed. Ordered to repay £16,918, suspended from the House of Commons for 10 days and removed from the party whip. Cash for Influence (2009). Details of covertly recorded discussions with 4 Labour Party peers which their ability to influence legislation and the consultancy fees that they charge (including retainer payments of up to £120,000) were published by The Sunday Times. United Kingdom parliamentary expenses scandal (2009), following the disclosure of widespread actual and alleged misuse of the permitted allowances and expenses claimed by Members of Parliament and attempts by MPs and peers to exempt themselves from Freedom of Information legislation. The Iris Robinson scandal in which First Minister of Northern Ireland Peter Robinson stepped aside for six weeks in January 2010 following revelations of his wife’s involvement in an extramarital affair, her attempted suicide and allegations that he had failed to properly declare details of loans she had procured for her lover to develop a business venture. The 2010 Cash for Influence Scandal, in which undercover reporters for the Dispatches television series posed as political lobbyists offering to pay Members of Parliament to influence policy. On 29 May 2010 Chief Secretary to the Treasury David Laws resigned from the Cabinet and was referred to the Parliamentary Commissioner for Standards after the Daily Telegraph newspaper published details of Laws claiming around £40,000 in expenses on a second home owned by a secret partner between 2004 and 2009 whilst House of Commons rules have prevented MPs from claiming second home expenses on properties owned by a partner since 2006. By resigning Laws became the shortest serving Minister in modern British political history with less than 18 days service as a Cabinet Minister. On 14 October 2011 Secretary of State for Defence Liam Fox resigned from the Cabinet after he “mistakenly allowed the distinction between [his] personal interest and [his] government activities to become blurred” over his friendship with Adam Werrity. Conservative Party ‘Cash for Access’ scandal, March 2012. In April 2012 Conservative Party MP and culture secretary Jeremy Hunt came under pressure to resign as a result of his closeness to Rupert Murdoch’s media empire and alleged corruption in dealing with Murdoch’s bid for News Corporation’s takeover of BSkyB. In October 2012 Andrew Mitchell resigned from his post as Chief Whip following allegations made about his conduct during an altercation with police at Downing Street on 19 September, the incident becoming known as “plebgate”. I have more A LOT MORE ! Keep it coming , Spit it out . You make a good case for why Britain should leave the EU , even though that might damage it beyond repair . Perhaps you could list all the corrupt people in all 28 member states . You’re correct that we have in the E.U. nation states bunch of corrupted m*r*ns too ! Without an Elected E.U. President and strong control as Tony Blair urged in 2009.. the E.U. States remains persistently corrupted ! Would be better that Britain federate the E.U. and defend the single market and the economy against the rising jobless (At least in the Eurozone)! It’s not for nothing that Greece vote for Syriza thanks to Angie ‘s Austerette plan and inequalities ! The last ressort to save on what’s still remains to save is a strong political committement but We know already that the E.U. Council of 19 (Or 28) don’t prefere an real elected Leader from eu-people like in Britain ! At least Britain has a good economy for instance and should retain it’s strongness in economy instead to jeopardize in remaining FULL IN as Cameron stated ! Nor will accept England to adopt the Euro ! Anyway the word “Might” is understated and I would say IT’s already irreparably damaged ! Illusion that the U.K. remains in the E.U. is an Utopia now ! That should be a top lesson for the E.U. too and at the same time to revise and strenghtens or pool their financial policies in an equalized way for the economy and for dropped jobless without suffering anymore or further damage the economy but this needs courage and not cowards ! The British problem is that , I’m guessing , the majority of the people did not want to be members of the EU . No matter what successive governments , banks and businesses thought best , the British people want rule solely from Westminster , Not Brussels . Euroscepticism is very outspoken in Britain , there is an absolute Hatred of the EU political and bureaucratic establishment . British people love Europe , its varying cultures and customs from country to country . The EU has an elected president , but it is more of an honorary guiding role than real leadership . The EU is in effect a proportional representation of 28 , which forms a very weak government , unable to make clear strong decisions . No and Yes the E.U. has only an elected President of the Commission of the People’s Party but on the TOP? There is nothing than a deep hole rather on the Top and no real governance for financial and citizen’s protection at this level ! Unlike Britain the Eurozone doesn’t pay even a damn fiscus @ E.U. Level which is barely needed ! One thing is sure the “Commonsense” will be found either on good way or bad way ..